Finding love has never been easy. 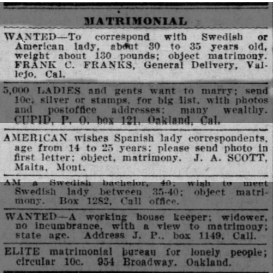 As early as the 1890s, people were using the papers’ classified section to place matrimonial ads, which were essentially want ads for a spouse. The first ad I came across is from 1909. This fellow seems heartfelt, if not grammatically inclined. 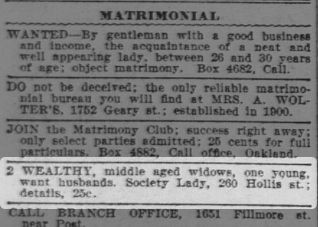 This 1905 Babu Matrimonial Advertisement introduces us to a gentleman of 36 who is a self-described “independent, beautiful young widower… very rich family.” As if this wasn’t enough to start an all-out war for his affections, our hero (whom we’ll call Catfish) subtly mentions he still has his late wife’s jewelry. Hold on to your heart, ladies! Next up, we have Frank C. Franks, who was seeking a wife of either Swedish or American origin in 1910. Specifically, a Swedish or American wife who weighs about 130 lbs. But before you go thinking it’s kind of shallow of Frank Franks to dictate his future wife’s weight, get a load of J.A. Scott, who is looking for 14-year-old “Spanish lady correspondents”. Por favor, senoritas… send a photo with your first letter. J.A. Scott doesn’t waste much time. After reading J.A. Scott’s ad, Frank Franks looks better and better! Bachelor Number Five appears on the scene in 1906, and he doesn’t make age or weight demands. He does require a minimum bank balance. Perhaps I’m jaded, but it seems like many gentlemen are willing to marry a lady with means. Ladies of means are always popular! Of course, it isn’t all men seeking women. There are a few bold ladies out there, looking for love. Two “middle aged widows” released a joint personal ad in 1906, seeking husbands. It’s a little odd they didn’t buy separate ads, since they describe themselves as wealthy. Perhaps they were just frugal souls. Or maybe they felt like their ads would be duplicative – the only difference between the women seems to be that one is middle-aged and young, while the other is just middle-aged. “Hi, yeah, I read the ad about the widows.